Applecroft Earl, the home bred bull from John and Sharon Houston from Bangor, Co Down took the highest bid of 3500gns and the ribbons for reserve champion in the pre sale show judged by James Weightman from the Hallfield herd Co.Durham at the first British Blonde export sale held at Moira Pedigree Sales Arena sold by Michael Taaffe and sponsored by Northern Bank. Applecroft Earl weighing 848kgs out of Applecroft Beam sired by Applecroft Copper makes his way to M Harrisons Shapfell herd, in Cumbria. The second highest price on the day went to Davey Thompsons bull Glenvale Fantastic born 15/01/2010. Selling for 3020gns to Barry O Reilly from Enniskillen, Co Fermanagh, this bull out of Glenvale Christina sired by Islandhill Billy stood at 710kg and also took a first prize in his class. 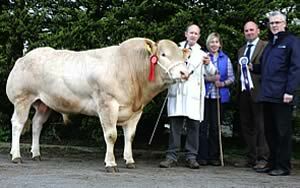 Champion Blonde in the presale show was Shanvally Fletcher born 15/04/11 was the youngest bull entered. Shanvally Fletcher out of Mayola Velvet sired by Ashtonlodge Tyson weighed 678kg. Fletcher is half brother to Seaview Barney who has won numerous championships over the last couple of years. Shanvally Fletcher was joining his stablemates Shanvally Enter and Shanvally Euro who took the champion and reserve champion titles respectively at the Blonde sale in Carlisle two weeks previously to the credit and pride of Sean and Paul Savage from Ballynahinch, Co. Down. Top priced female born 14/02/10 selling at 1820gns was Drumraymond Fea E.T a Druk Lance daughter out of Drumraymond Rose who has bred many show cattle including Drumraymond Utah who went on to be a well known show winner. Selling to Daryll Moffitt who runs the Arvalee herd from Co. Tyrone, who had made his earlier purchase of Budore Evan at 1750gns from Paul McGarry from Crumlin, Co.Antrim. Glenvale Freda again from Davey Thompson was the second highest priced female on the day, a Budore Utah daughter out of Glenvale Panache sold at 1700gns to Alistair Stewart from Limavady, Co.Derry. Hillhead Felicity bred by M R Rodgers and Son from Ballynahinch, Co. Down, won Champion Female. Hillhead Felicity out of Hillhead Verity who was breed champion at both The Royal Ulster Show and Highland show, and sired by 2005 and 2006 Paris show winner Sauveur sold to Paul Downey from Co.Antrim for 1600gns to welcome to his Lurgy herd.